To understand the motivation and source of my Frog Prince painting’s inspiration it’s probably best to break it apart and examine the bits close-up. The central figure is the frog prince, which was chosen because of my interest in the ambiguity of characters. Is he a prince or is he a frog? Is he a prince who has been turned into a frog or is he a frog who may get turned into a prince. He occupies both states in my mind, like Schrodinger’s cat, both dead and alive, a symbol of potential. As well, the frog has many symbolic meanings to various cultures, including good luck and fertility. Adorned by a multi-faced crown, his status signifier is ambiguous with its conflicting expressions ranging from angry to neutral to happy. Again, the uncertainty, the beguiling nature of emotions or states in flux appeals to me deeply and should register in the viewer’s mind as a point of contemplation. Crowns have always symbolised a certain status/prestige kind of theme to me, which is easily lumped into the whole ego/esteem domain and a fun territory to explore. Above the crown hovers the spectre of death, clearly glancing to the left hand side of the painting for reasons that will soon be made apparent. If the painting is bisected down the middle it gets thematically divided, with despair and decay on the left and prosperity and abundance on the right. Though this may be a trite dichotomy, I feel like the use of new symbols and standard conventions opens up a fresh way of looking at things. The tall figure on the left is the spectre of time as a grandfather clock, trudging under the weight of his chains like Marley’s ghost—anchored to the sins of his past. This is a little play on the word zeitgeist (time ghost/spirit) but also establishes the themes of despair (his ghostly obligation, condemned to carry his burden) and decay (the by-product of passing time) also shows in his forlorn expression as he watches his hand (hands of time) disintegrate. On the far left is a dinosaur engaged in the futile task of grilling a steak he cannot eat, since he has no mouth and his entire head is an eyeball. His eye is clearly bigger than his stomach, which means he wants more than he can actually have. Prehistoric creatures fall into the theme of despair and decay without even trying. They are extinct, long-gone figments of the past, which again tie into the theme of time. At the bottom left is a decomposing birthday cake, frosting putrefying and candles that typically denote the years and the passing of time, askew and blinding the cake’s agonized face. At the bottom left is also a pull-toy in the form of a housefly. Contrasting the cute and cuddly with the vile and repulsive, flies stand for decay in a way that makes them uniquely qualified as experts. Their maggot offspring thrive on decay and as adults they frequent spots of disgust to lay their eggs and socialize. I like the humour of the toy/food relationship too. The toy is arguable the frog’s and also a housefly would typically be a food for the frog. The old, emaciated man reaches inside the frog’s mouth for a morsel or is the frog biting his arm? An act of desperation seems more likely, given the meagre meal the old man would offer. The lengths someone will go for survival including eminent peril, makes the act more heroic than pitiful. C’mon, I don’t have to spell it out for you…do I? One of the only characters inhabiting the painting that seems to be enjoying himself is the milk glass. Even though he is carelessly spilling himself for the shear fun of the flight he is exemplary of wanton waste, conspicuous display and the thrill-seeking nature of wealth. His honey sidekick seems to be just along for the ride but his stoic demeanour is part of his blasé personae—everything is too boring—been there, done that. This creature devours the landscape, just as we carelessly plunder ours for resources at risk of depletion. When there is plenty to be had we seldom consider a time when there would be otherwise. In his tentacles are spoons (silver?) one of which is using its own spoon to sample the meal. In some way this is a comment on subservience, each subsequent link gets a smaller portion. Yes that’s a pot of gold at the end of the rainbow on the right. If the arc of the rainbow is followed to the left hand side of the painting it leads to a bucket of slop. The frog neglectfully ignores the doll draped over its arm. The doll appears to be “dead”, with cartoon Xs for eyes and comports a limp posture. A doll is a surrogate for the real thing and thankfully the frog is only lord over a pretend baby, since his attention is obviously directed to his more self-interested distractions. Bubblegum Surrealism: Stephen Gibb – Artist Statement concerning pop surrealism in Canada as a contemporary Canadian artist. Canadian art is a fractured story of borrowing and appropriation from all cultures. Canadian Surrealism is the category what I most often associate my art with. 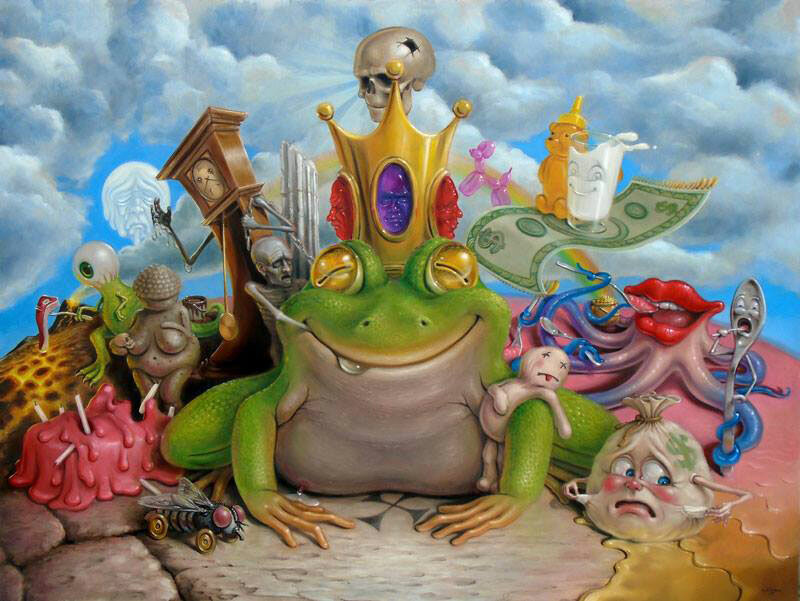 This entry was posted in Canadian art, Canadian Artist, Canadian Surrealism, Pop Art, Pop Surrealism, surreal, Surrealism and tagged bubblegum surrealism, canadian artist, canadian surrealism, Frog Prince, land of milk and honey, money bags. Bookmark the permalink. Both comments and trackbacks are currently closed.